Four tours to discover Verona’s history, culture and artistic attractions and much more besides. Immerse yourself in Shakespeare’s 16th century world, discover one of the world’s most famous wine roads and plan your trip to Verona to the full, making it a novel journey through the senses and discovering the most beautiful places in the city and the Veneto region as a whole. Following in the footsteps of Romeo and Juliet with the "ART & CULTURE" itinerary, discovering one of Italy’s most famous Roman arenas. Northern Italy’s most famous wine road will no longer be a closed book with a made-to-measure FOOD AND WINE TOUR. Discovering the Po plains with a Verona SURROUNDING AREAS itinerary to explore the area’s inimitable style. Re-live the dolce vita on a SHOPPING trip around the town's best known boutiques and find out how the most important brand name clothing is made. Once you leave Hotel Due Torri your journey in discovery of this wonderful town begins a short distance away from the hotel with the itinerary’s first stage: Cattedrale Santa Maria Matricolare. Hidden amongst townhouses Verona’s cathedral stands out with its Romanesque architecture supplemented and radically remodelled in the Gothic and Renaissance eras. Returning towards the centre we pass the Arche Scaligere, a funerary complex in Gothic style which holds the tombs of the most important members of the Della Scala family which long ruled over Verona. Just a short distance away we come across the first ‘Shakespearian’ site, Romeo’s house, a characteristically fine medieval building with a wonderful courtyard. The house belonged to the Montecchi family and melds Romanesque, Gothic and Renaissance styles. Returning to the Arche Scaligere we are catapulted into Piazza dei Signori and once here we cannot avoid noting the arch which links it to Piazza delle Erbe. Piazza delle Erbe is one of Italy’s most characteristic and best known squares. Sited on the location of what was, in the Middle Ages, one of the hubs of the town’s economic and political life - and thus once its Roman forum - it is now the historic centre’s beating heart. Piazza delle Erbe is the site of one of the town’s most panoramic points, a tower whose 84 metres of height combines a mixture of materials and styles which enliven a whole of unrivalled beauty. Don’t miss the chance to climb up Torre dei Lamberti to admire views across the whole of Verona from a unique and unusual perspective. 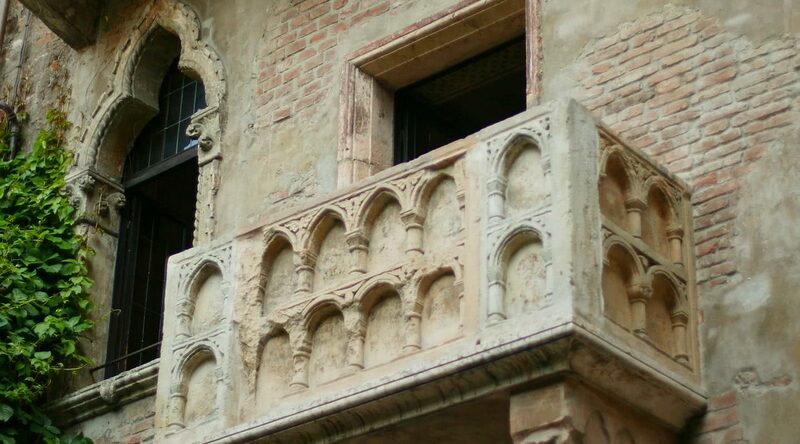 Verona is truly a town in which history and literature meld into one, in which the legend of impossible and ill-fated love took shape and catapulted it to world fame, thanks also to one of its most celebrated sites: Juliet’s house. Just a few metres from Piazza delle Erbe, on foot along Via Cappello, one of the town’s most graceful streets, takes you to Juliet’s famous house. Before you even go into the courtyard you will notice the unusual nature of the place with its walls covered with love letters and notes left by lovers from all over the world. This is where the famous balcony from which Shakespeare has Juliet hear Romeo’s declaration of love. Just a short way away from Juliet’s house is Via Mazzini, Verona’s main street linking Piazza delle Erbe and Piazza Bra: it is the ideal street for shopping with all the main fashion and luxury brands and dazzling classical architecture all the way along Via Mazzini. Verona’s main claim to fame worldwide is its Roman arena in massive and majestic Piazza Bra. Piazza Bra is one of Italy’s largest and most beautiful squares and Verona’s beating heart. It is flanked by Palazzo della Gran Guardia, now an exhibition and conference venue, Palazzo Barbieri, the town hall, and Verona’s Arena in the middle. 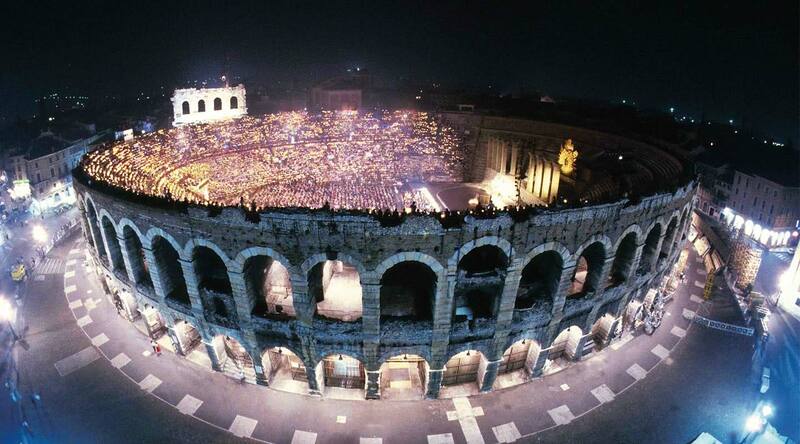 Symbol of the town, Verona's Arena attracts thousands of visitors every year and not only for its history and beauty. It also draws people in with its important events and concerts as the third largest Roman arena by seating capacity in Italy after the Colosseum and the Capua Amphitheatre, holding 20,000 spectators, and the only one which is still fully functioning thanks to ongoing maintenance work enabling it to host a wide range of events. The last stage in our Verona tour is inevitably Castelvecchio and Ponte Scaligero, the bridge across to it and a truly beautiful vantage point from which to admire the Adige river. Just a short distance from the centre the views over the whole town and the Arena are breath-taking and unusual, making it the ideal place from which to watch the sunset or visit the courtyard with its statue in the shape of a dog, symbol of faithfulness, Reggia degli Scaligeri and the Museo Civico di Verona, all absolutely not to be missed. Drunk on these beauties, history and culture stroll back to Hotel Due Torri where a rich array of traditional culinary delights awaits you at our restaurant. The Due Torri Lounge & Restaurant is a place at which to experience dinners as a taste discovery journey. This tour around Verona’s and the Veneto region’s culinary delights begins with a buffet breakfast at the Due Torri Lounge and Restaurant situated in the hotel’s spacious and magnificently decorated lobby or, in the warmer months, on our panoramic terrace which affords a new vision of the town with views stretching from Torre dei Lamberti to the cathedral, from Castel San Pietro to the Torricelle with its gentle hills and the waters of the Adige river acting as scenic backdrop and soundtrack. 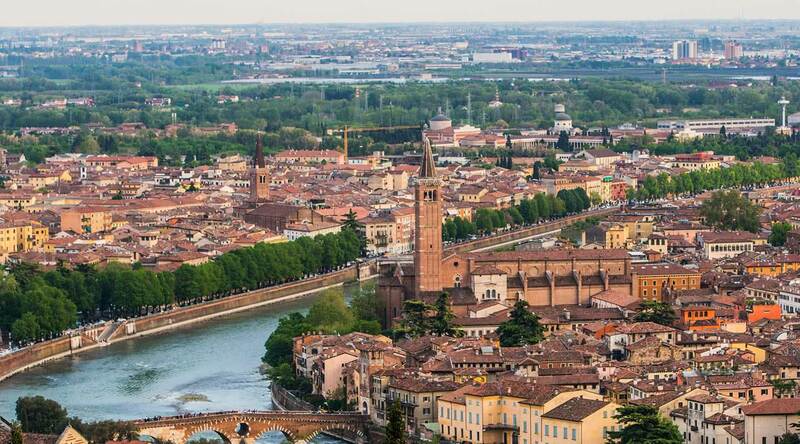 The Verona area is one of Italy’s most famous for top quality vineyards making fine wines, famous the world over. Verona’s wine road follows a series of itineraries and roads along which visitors discover the area’s natural, cultural and environmental values and its vineyards and estates which welcome in tourists in search of the wonders the land offers: Valpolicella, Bardolino and Amarone are just some of the main DOC Protected Designation of Origin produced in the Verona area. And neighbouring Franciacorta, the hilly area between Brescia and the southern tip of Lake Iseo, is one of Italy’s largest sparkling wine making areas. Valpolicella is the home of Valpolicella Superiore and Ripasso, sweet Recioto and the ultra-famous Amarone. Bardolino DOC, on the other hand, is grown in Verona province and more precisely in the south-eastern part of Lake Garda in the area between Peschiera, Bardolino and Castelnuovo. This profusion of delicacies, above all in wine terms, means that there are many possible food and wine itineraries in Verona province and Hotel Due Torri’s staff is on hand for any information you may need or to organise a made-to-measure food and wine tour comprising guided visits to the wine estates and towns where some of Italy’s finest wines are made or personalised and private cooking lessons to learn about the Veneto’s culinary culture. No trip to Verona should miss out on this history and culture packed area, countryside and towns, a journey around Italy’s traditions. The itineraries in this section are truly beautiful: the first winds its way through the countryside around Verona, passing Lake Garda and seeking out its most attractive views while the second passes through Padua and continues to Venice, the town which is famous the world over for its canals, an itinerary which will take you around the Veneto’s main towns. Starting from Due Torri Hotel, the first stage on itinerary one is Lake Garda, and Sirmione to be precise, whose privileged position makes it the lake’s most beautiful and characteristic. Sirmione is aptly called ‘The Pearl of Lake Garda’ for the beauty of the landscape around it and its splendid medieval town with just one access route via a bridge. Strolling along the streets of the town centre is a veritable journey through the Middle Ages with its characteristic narrow and rectangular period streets flanked by brick and bare stone buildings. Begin your journey by crossing Castello Scaligero bridge to the town. This is Sirmione’s first attraction and the castle is truly a lake side fortress as the only access point to the town and washed on all sides by Lake Garda. Leaving the castle behind, the next stop is the Grotte di Catullo, the ruins of a Roman villa in Sirmione and the most imposing Roman architecture in Northern Italy. Leaving Sirmione we return to the Veneto region for a further iconic Lake Garda town: Peschiera del Garda. In Peschiera let the magic of its splendid lake views wash over you. Peschiera is one of Lake Garda’s best for lake views thanks to its many kilometres of lakeside. Another not-to-be-missed attraction is its Venetian walls with their medieval origins encircling the historic centre whose times past atmosphere is once again characterised by cobbled streets and picturesque townhouses with panoramic views over the lake. Before you leave a must is a gourmet lunch at one of the town’s restaurants which the staff of Hotel Due Torri will recommend for a taste of Lake Garda’s local products and flavours. The last stage is the town of Soave-Bonifacio, known as one of Verona province’s main medieval towns and home of the wine of the same name. Soave’s main attraction is Castello Scaligero on the high ground above the town and with panoramic views over the whole town and the vineyards around it. Its views and vineyards will win you over and it is the ideal town to complete the first itinerary and relax with an excellent glass of DOC wine. Having completed our first itinerary we can now look at our second which is not far from the first and will take you to the Veneto’s largest towns. Once again starting from Due Torri Hotel and travelling eastwards we soon get to one of the Veneto region’s most important towns: Padua with the Scrovegni Chapel frescoed by Giotto. There is spectacular art in every corner of this magnificent town, the Veneto’s third largest. In addition to the Giotto frescoes mentioned above, inside the baptistery and the cathedral is a further extraordinary fresco cycle by Giusto de’ Menabuoi. The first stage in this tour is one of the most important fresco cycles in the world, in the Scrovegni Chapel, painted by Giotto in just two years, depicting the lives of Joachim and Anna, Mary and episodes from the life and death of Christ. Leaving the chapel behind, make your way to Basilica di Sant’Antonio, ‘the Saint’ for the people of Padua, sign of their affection for the Basilica and its importance. It merits a visit both as a constant place of pilgrimage and for the sequence of Italian art masterpieces: the Roman façade, its Gothic ambulatory, its seven chapels frescoed by Andriolo de Santi and Giotto, its Byzantine domes and Moorish belltowers: the volume of art packed into and outside the church is truly astonishing. The next destination worthy of note is Palazzo della Ragione and getting to it requires crossing Piazza delle Erbe and Piazza della Frutta, historic market places and two of the main places in which to try out and soak up Padua life. The last stage visits one of the largest squares in the world, Prato della Valle which is approximately 88,620 square metres in size and has a single central island called Memmia, separated off from the rest of the square with a canal around 1.5 km long. There are four intersecting avenues with their own bridges to the central island. Prato della Valle has always been the hub of Padua life: there was once a great Roman theatre here and a circus for horse races. Two of the town’s four patron saints were martyred here, Saints Justina and Daniel. After leaving behind this attractive art town, it is now time to visit one of the world’s most famous and unusual towns: Venice, an open air masterpiece. After crossing the bridge which links Venice to the mainland, soak up the unique features of this celebrated town, much loved the world over..
Venice is truly a paradise for photography lovers: art, views across the water, buildings and details of an everyday life which seems to belong to a now far off past. All this is a great inspiration. Wherever you go in Venice there are unique panoramas and magical places. Here every stone has a fascinating story to tell. The most exclusive way to get to the heart of the town, St Mark’s Square, is on one of its gondolas. You can easily rent one of these on whichever canal is nearest to you. Once on board, if you take the Grand Canal, there are 250 magnificent palazzi, 15 churches and the famous Rialto Bridge to admire. In St Mark’s Square the view you’re welcomed with is one of Venice’s most characteristic: Basilica di San Marco, the Doge’s Palace, the belltower and a beautiful view of the lagoon. A visit to the Doge’s Palace gives you a glimpse into the doge’s private apartments and the republic’s representation rooms. Cross ultra-famous Bridge of Sighs to the prison Casanova escaped from. Basilica di San Marco is a unique example of western-eastern architecture, unparalleled in Europe. Its grandiose mosaics and pavements would suffice alone to justify a visit. A must is Museo Marciano - for an up-close look at the famous bronze horses and a view of St Mark’s Square from its loggia. Leave St Mark’s Square behind and walk along the Mercerie, Venice’s three most famous shopping streets, which will take you to the Rialto Bridge. Soak up the one-of-a-kind views from the bridge and wander around the streets and alleys which have made Venice so famous the world over. Every street and corner is packed with history, culture and unforgettable streets. “There is no world without Verona walls. But purgatory, torture, hell itself”, Rome and Juliet, Act III, Scene III. Near the banks of Lake Garda, with the Adige River as a backdrop and set in the wonderful Veneto plains, Verona has always been a land of desperate passions, peoples in transit and trade. It saw the rise of the della Scala lordship and with it, its beauty. It too is packed with riches and haute couture brands from clothes to shoes, jewellery, watches and leather. After a varied and tasty breakfast of sweet and savoury delicacies in Hotel Due Torri’s restaurant and, on sunny days, on the terrace with unrivalled panoramic views over the town. Begin your tour with a stroll down Via Mazzini for Italian haute couture and the most exclusive clothing, one of the centre’s main streets. An entirely traffic free zone, it is where most of Verona’s tourists are concentrated in addition to its haute couture boutiques. The first historic boutique you come across is Al Duca d’Aosta, a sophisticated, minutely designed space containing everything you need clothing-wise in a chic, classic style. Continuing with our upmarket and haute couture shopping theme, the second not-to-be-missed stage is: Alexandra Boutique, for sophisticated, eccentric, bold women who love luxury in all its forms. The result is high volume garments, bolero jackets, overcoats, bags and shoes - all elegant, extravagant and one-of-a-kind. Along the same street, Dev. Tod’s, for those looking for a colourful clutch bag, an everyday maxi-bag and accessories. Fay, if you’re looking for an overcoat, a trench coat, a duster, a shrug or a jacket. Hogan for lovers of sports sneakers with a stylish touch. Last but not least on Via Mazzini are Pavin Elements and Pavin Luxury. The first is ideal for those preferring casual chic. There’s all the clothing and accessories you might need here to put together a practical and comfortable look without sacrificing class and elegance. From Prada sneakers to Moncler shiny jackets, from Fred Perry polo shirts to Stone Island sweatshirts. The second, on the other hand, is the right place for elite shoes and bags. Sandals, Sergio Rossi peep toe sandals and Ugg skin boots. British Burberry bags to cosmopolitan Marc Jacobs. That extra touch of style is there everywhere. Piazza delle Erbe, at the end of Via Mazzini, has the last two musts in this Verona shopping tour: Alkimia and Lazzari. A multibrand shop selling avant-garde brands, that is how Alkimia defines itself, and it is one of the most famous with fashion brand names such as Watanabe, Dries Van Noten and Yamamoto. Its fame derives from having been one of the first in Italy to stock such upmarket brands. Lazzari is a classic shop with a unique style and atmosphere, a Parisian chic style with a slight touch of vintage, selling its own clothes and accessories. It is right here at the end of this luxury shopping journey that you get a glimpse into how a haute couture fashion brand is born, how an individual garment is formed task by task with a Parisian chic style and a touch of vintage. It has a number of shops across the Veneto region and is much loved by alternative but classy girls. Hotel Due Torri’s staff is on hand to provide you with all the information you may want and organise your made-to-measure shopping experience with personal shopper opportunities and the chance to visit the artisan workshops making the world’s most famous haute couture brands for an insight into their culture and philosophy.